Special Papers in Palaeontology, published by The Palaeontological Association, is a series of substantial separate works conforming to the style of the Palaeontology journal. Two issues are published each year and feature high standard illustrations. 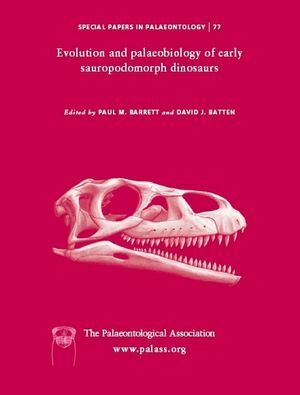 Paul M. Barrett and David J. Batten are both members of The Palaeontological Association. Foreword: P. M. Barrett and T. J. Fedak. 1. The First Complete Skull Of The Triassic Dinosaur Melanorosaurus Haughton (Sauropodomorpha: Anchisauria): A. M. Yates. 2. A Phylogenetic Analysis Of Basal Sauropodomorph Relationships: Implications For The Origin Of Sauropod Dinosaurs: P. Upchurch, P. M. Barrett and P. M. Galton. 3. The Evolution Of Feeding Mechanisms In Early Sauropodomorph Dinosaurs: P. M. Barrett and P. Upchurch. 4. The Pectoral Girdle And Forelimb Anatomy Of The Stem-Sauropodomorph Saturnalia Tupiniquim (Upper Triassic, Brazil): M. C. Langer, M. A. G. Franc¸A and S. Gabriel. 5. Were The Basal Sauropodomorph Dinosaurs Plateosaurus And Massospondylus Habitual Quadrupeds? : M. F. Bonnan And P. Senter. 6. A New Description Of The Forelimb Of The Basal Sauropodomorph Melanorosaurus: Implications For The Evolution Of Pronation, Manus Shape And Quadrupedalism In Sauropod Dinosaurs: M. F. Bonnan and A. M. Yates. 7. Bone Histology And Growth Of The Prosauropod Dinosaur Plateosaurus Engelhardti Von Meyer, 1837 From The Norian Bonebeds Of Trossingen (Germany) And Frick (Switzerland): N. Klein and P. M. Sander. 8. What Pneumaticity Tells Us About ‘Prosauropods’, And Vice Versa: M. Wedel. 9. New Information On Lessemsaurus Sauropoides (Dinosauria: Sauropodomorpha) From The Upper Triassic Of Argentina: D. Pol and J. E. Powell. 10. New Information On The Braincase And Skull Of Anchisaurus Polyzelus (Lower Jurassic, Connecticut, USA; Saurischia: Sauropodomorpha): Implications For Sauropodomorph Systematics: T. J. Fedak and P. M. Galton. 11. Basal Sauropodomorpha: Historical And Recent Phylogenetic Hypotheses, With Comments On Ammosaurus Major (Marsh, 1889): P. C. Sereno.